The Louis Vuitton Foundation in #Paris has been called a “gift to France.” But according to some critics, the private museum founded by billionaire art collector Bernard Arnault was a gift that came at a spectacular cost to French taxpayers. Now, an anti-corruption group has filed a complaint accusing the foundation of fraud and tax evasion in the Court of Auditors in #Paris, France’s financial taxation watchdog. It would be extremely rare to find a signed #caricature by internationally collected artist Antonio “Diego” Voci, even though, he did thousands. And if he did sign, it would be some form of Voci through 1965. Caricatures were a source of Diego’s quick money in his early years. Diego was known to complete 20 drawings in one sitting of only a couple of hours. Helga Voci, (Diego’s widow) was his constant companion for 25 years (1960 until his death in 1985). Diego loved the “creative spirit” of “Surrealism”, a cultural movement that began in the early 1920s, and is best known for its visual artworks and writings. Diego’s muses were women…..“A man look at woman… this is cerebral feeling. Venus is love god … who made her? In reality Venus never existed. I like for example fat woman … that’s the way I build Venus. Or I like the skinny woman … that’s the way I build Venus. If I am important enough, that’s enough to influence 90% of the world.” DIEGO, 1974. This painting was purchased on September 9 1980 by Captain Kenneth Zielmanuski (in Ramstein, Germany). Do you know where this painting is now?? Contact diegovociproject@gmail.com. A painting by Camille #Pissarro “Shepherdess bringing in sheep” will return to a #Jewish family in #France whose art collection was looted by the Nazis in #1941, a lawyer who led the negotiations said. The #University of #Oklahoma will give back “La bergere rentrant des moutons” — or “Shepherdess bringing in sheep” — to #Holocaust survivor Leone Meyer, her New York lawyer Pierre Ciric told AFP about the restitution agreement signed Monday. Meyer is the adoptive daughter of late businessman Raoul Meyer, who was co-owner of the French retail company that owns the upscale department store chain #Galeries #Lafayette. He deposited his art collection in a vault at the bank Credit Commercial de France in 1940 before the Nazis seized it during their occupation of France. #Corot influenced Pissarro and Pissarro had an influence on many generations, one being DiegoVoci™. (In the below image) is a DiegoVoci™ titled. “Der Markt”. Search DiegoVoci™ on Google and YouTube. Stephen and Wendy Max, collectors of #DiegoVoci™ works of #art and past exclusive agent for Diego’s works in #Canada. “…In 1975..We continue to have fond memories of a motor trip, early in our tour, to #France. One of the first great European City’s we visited was #Paris. “Dans La Rue” is the Diego oil painting which helps to keep those memories of “The City of Love” alive and current. Here, Diego created an immersive work capturing stunning detail which explodes with #color. This oil on #canvas represents one of our more memorable trips, with its perfect depiction of a moment in the streets of #Paris. Its simple #beauty, coupled with the complexity of form strikes you at every level (just like #Paris itself) with its eloquent yet subtle depictions of its people. Suddenly an Italian sculptor, #Gigi Guadagnucci http://www.gigiguadagnucci.com/ (whom we had already known from before) entered together with Diego (had never seen before) and they came to sit at our table. We had a nice chat and some time later they left. See Gigi Guadagnucci below. I didn`t see #DIEGO for several weeks and then one day I was in a Bank to change some money when I heard a voice behind me….”Mademoiselle Helga…”, I turned and saw #DIEGO behind me and he said: “Can I give you a lift with my car?” I must say at that time I had met many artists who were quite poor, they were all seriously working, they mostly had small ateliers, no comfort, happy when they sold a painting, and then invited the others. And when they didn`t sell – just eating bread and black coffee. Nobody had a car, in fact #DIEGO was called: “el pintor con coche” (which means- the painter with a car). So, when I heard #DIEGO inviting me in his car I thought: this man is showing off, besides the car he was very well dressed, like a businessman. So I said: “I have to go to school and it`s very close, I can walk there, I don`t need a car.” Finally he convinced me to sit in his car and he explained to me that he had seen me, left the car outside the Bank at a corner (double-parked) in order to follow me and that he had to move the car. 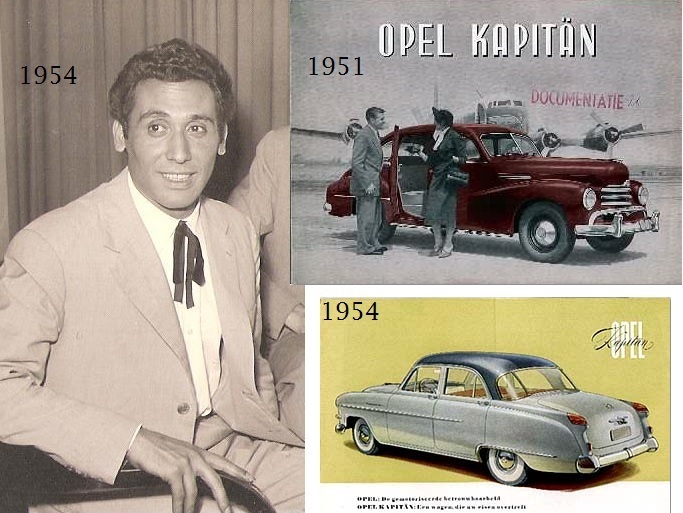 See Diego’s in 1954 and an example of Opel Kapitan car below. Okay, this was the beginning of a 25 years lasting love, we stayed together until December 1985 when #DIEGO died of lung cancer. In #Paris we stayed until October 1960. We had a wonderful time, I became acquainted with another part of Paris, we went to fantastic Restaurants, we met very interesting people, many artists, long discussions in – La Coupole– http://www.lacoupole-paris.com/en/, a famous place, that has been frequented by such artists as such as Yves Klein (painter), Jean Paul Sartre and Simone de Beauvoir (both writers) and many others. #DIEGO was living in a small Hotel near the Seine, he did not really work, just a few sketches from time to time and I was wondering how he was financing his living. He made a big secret about his finances. He spent quite a lot of money, he had a big car and he hardly worked. From time to time he went off from #Paris for a few days or a week and then everything went on again. He told me that he was separated from his wife Josiane, maiden name Schäfer, she was from #Geneva, #Switzerland. I know that he had been living with her for some time in #Geneva and also in Wiesbaden but how he made his living at that time I don`t know. Whether he was painting or not, he never talked about it. Diego Voci on YouTube and Google. This site is authorized by Helga Voci, sole owner of the Diego Voci Estate. #DIEGO VOCI Aficionados get a special bonus. Nobody knew #DIEGO VOCI better for 25 years than Helga Voci. She is sole owner of the Diego Voci Estate and provides us with this terrific insight into her, and her years with #DIEGO VOCI. Chapter One: Who is Helga Voci? “I was born in Prague, Czechoslovakia in 1939, just before the war started. My parents were Germans, at that time many Germans had been living in Czechoslovakia for generations. When the war started my father had to join the army and he was killed in 1941 in Russia, my maiden name was Drössler. In 1945 all Germans had to leave Czechoslovakia (because Hitler had lost the war) and we were brought to Germany, my family to Bavaria. “Prag / Tschechin”, D. Voci 1964, oil on wood, 56 x 80 cm. In 1948 my mother married again, her name was then Brandl, I kept the name Drössler. After high school I went for 1 year to a Hotel boarding school, where I received my diploma when I was 18. In order to improve my language knowledge in English and French which was very important for that profession, I decided to go to Paris together with a girlfriend of that school. A few months before we had made a short trip to Paris to find out what possibilities we had to find accommodations, the right school and the way to make some money, as my family and her family were not quite happy about the idea to see us in Paris (this was over 50 years ago!) and did not want to finance this project. Anyway, we took the train in December 1957, went to Paris, took a taxi and went right away to school. There was a big blackboard in the hallway with many ads of families who were looking for au-pair girls. We called several numbers and within short time we both had a place to live. #RAMBO is an artist? #ROCKY is an artist? 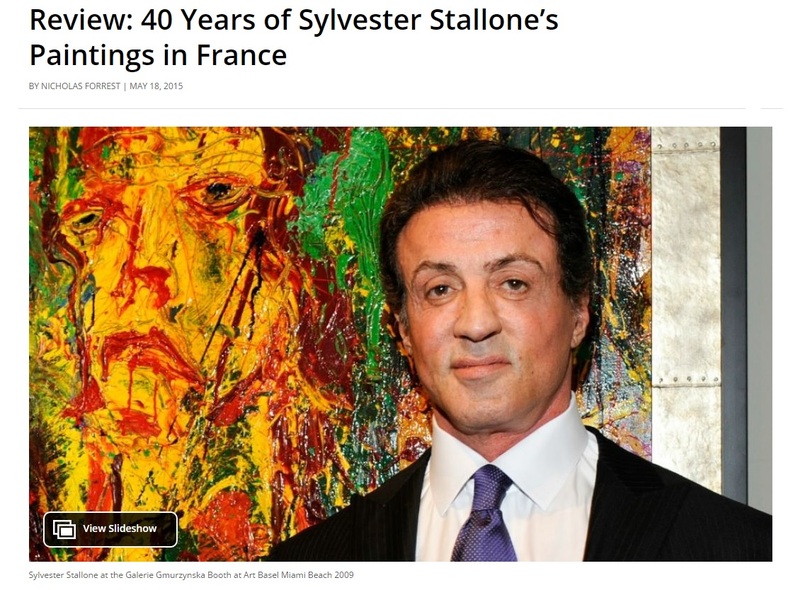 Who would have guessed that Sylvester Stallone of ROCKY/RAMBO fame is celebrating 40 years of his #artwork. All of the fierce pain from cancer metastasizing and sapping what was left of his strength, #DIEGO could not stop drawing. Drawing was as important to Diego as breathing. “Diego drew every waking minute”, said Tony Voci, nephew, of his 1957 trip in #Europe with his art compelled uncle Diego. So weak he could barely hold the pencil in his last hours, this is his final artistic expression. 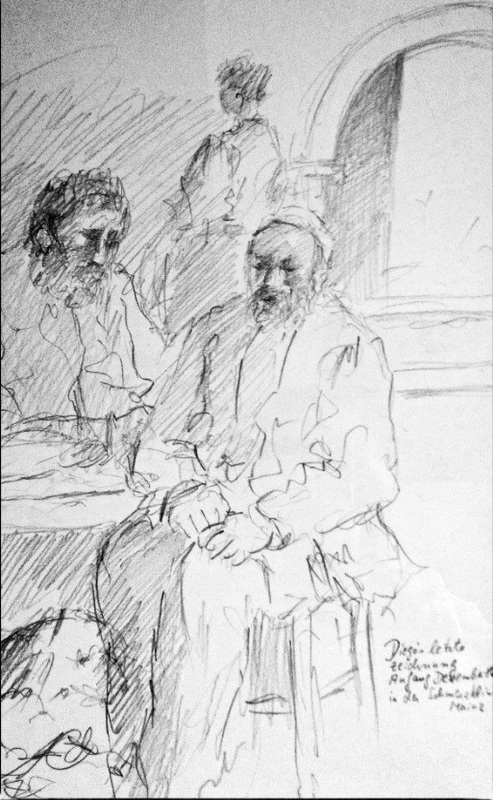 A small sketch that Helga Voci treasures as much as her husband’s best #masterpieces.